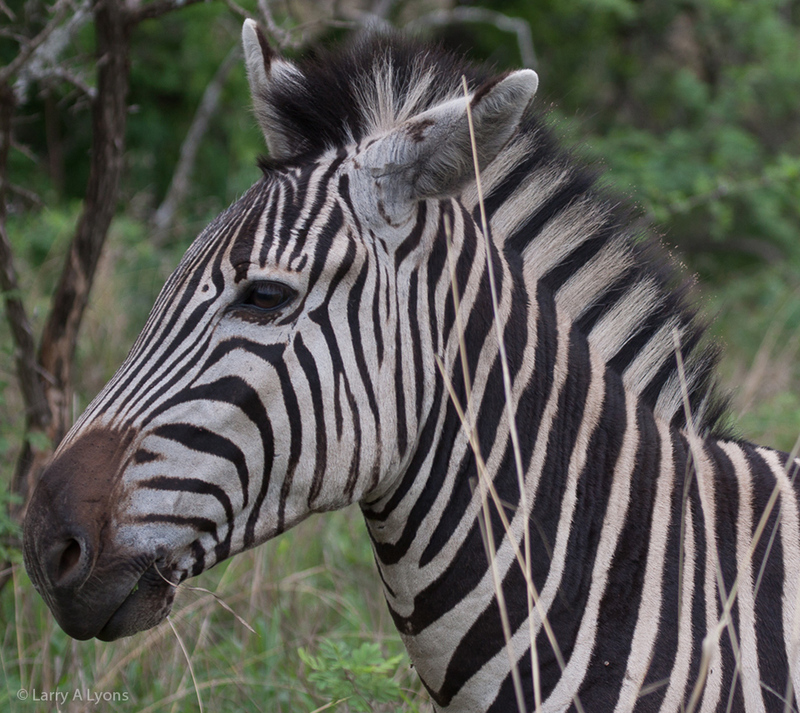 Like seeing squirrels or rabbits in our backyards, the wildebeests, giraffes, zebras, impalas and warthogs were common everyday faces observed at the Thanda Game Reserve. They help depict the diversity of life on the African prairie. All five of these species are herbivores and also become an important food source for lions, leopards, wild dogs, cheetahs and hyenas. All of these images were captured in South Africa at the Thanda Game Reserve while volunteering for six weeks with the African Impact Organization (www.africanimpact.com) in September through October 2012. 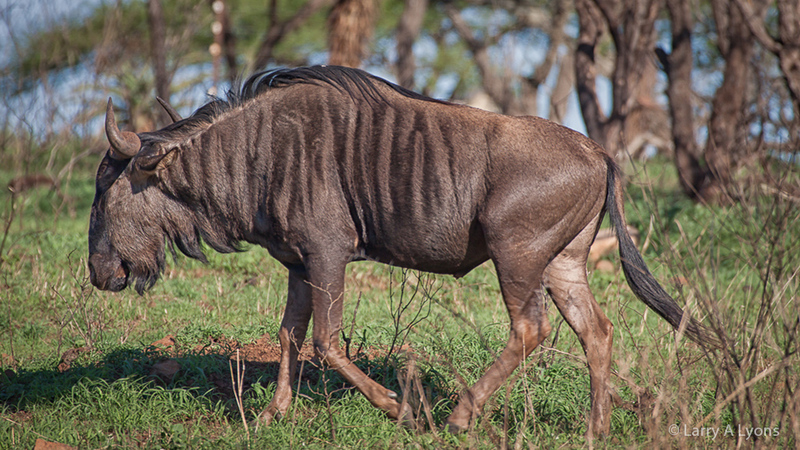 The wildebeest is an antelope, but it looks like part buffalo, part horse, and part antelope. They are primarily grazers with grasses being their predominant choice. 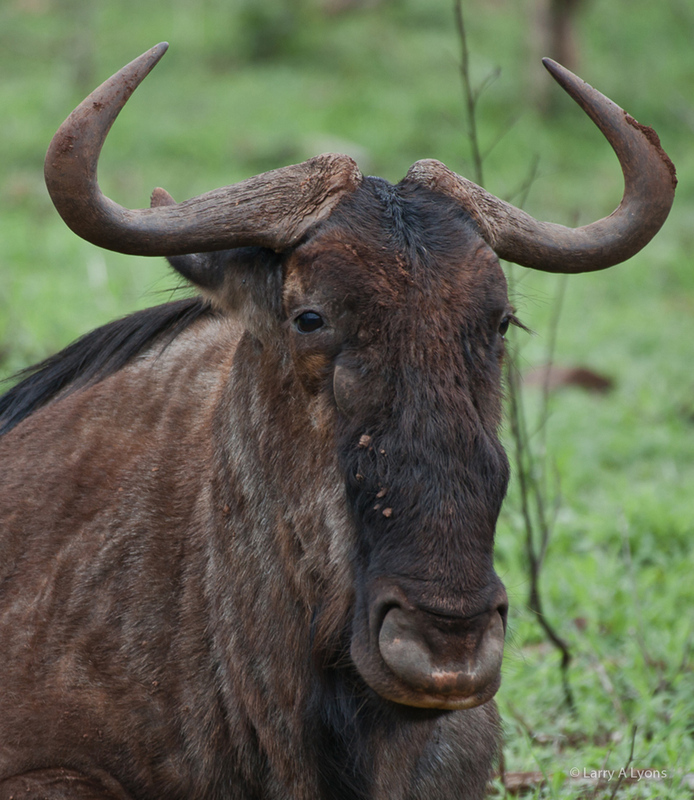 At the Thanda Game Reserve, the wildebeests are often seen in small herds of about eight to ten cows. Time for a dust bath says this wildebeest. 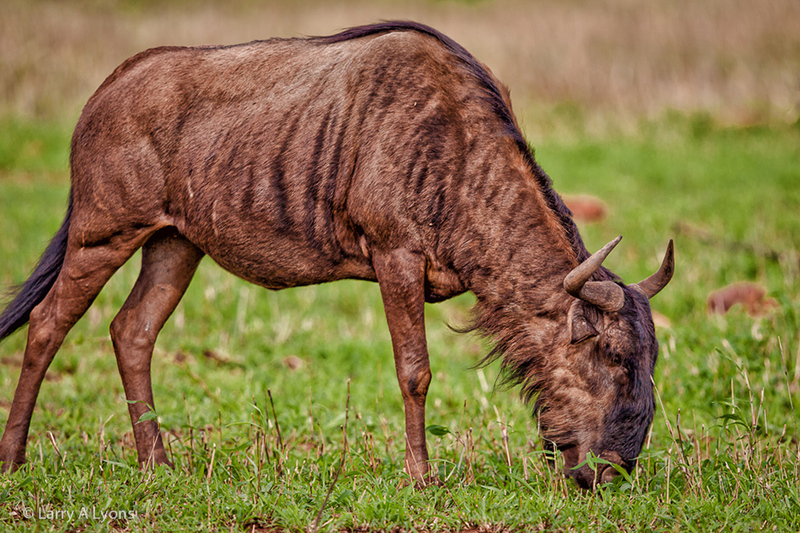 Wildebeests can spend one-third of their day grazing with the remainder roaming about or taking a rest. 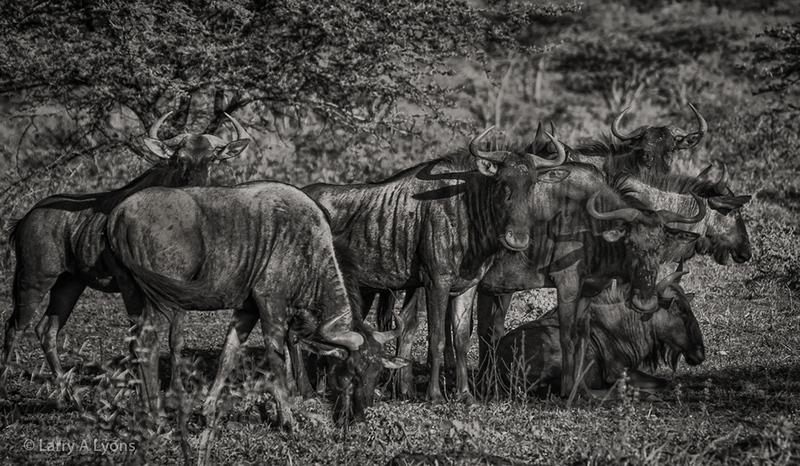 Wildebeest predators include lions, leopards, wild dogs and hyenas. Everything is recycled on the African savanna. 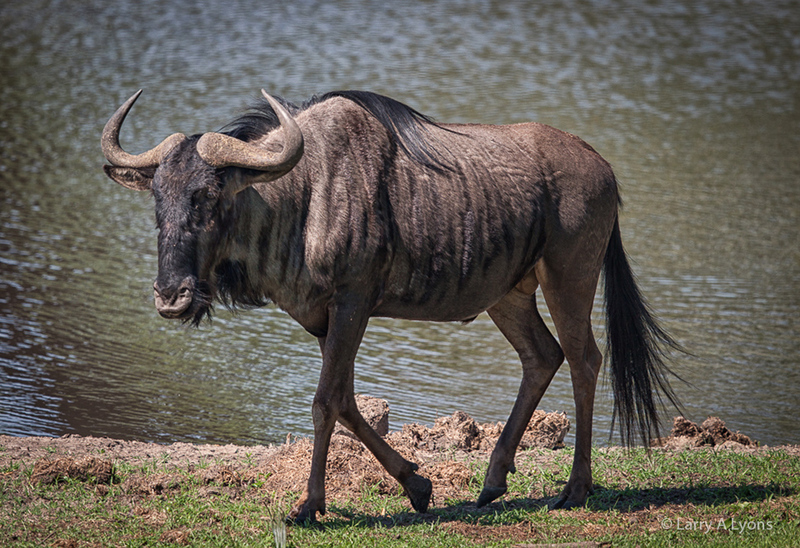 Wildebeest prefer to stay close to water. They cannot go without water for more than a few days, particularly during dry seasons. 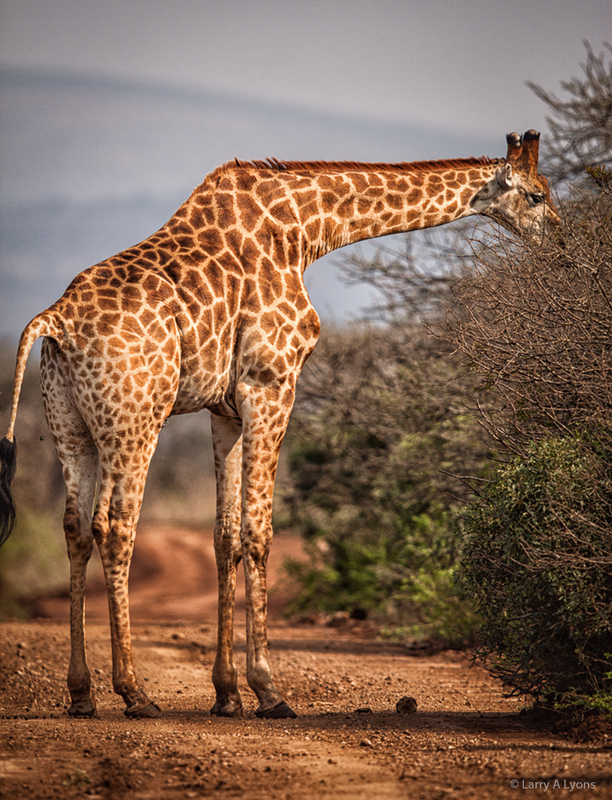 The giraffe, the tallest in the animal kingdom reaching heights of 18 feet (5.5 m), is just simply a gentle giant. Often observed on the reserve’s roadways, it is, of course, given the ‘right of way’. 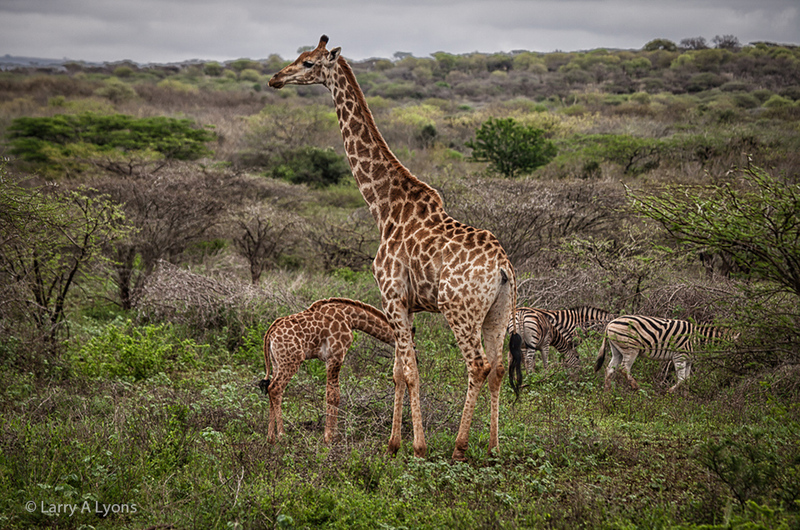 Giraffes are social with other animals (zebras, wildebeest, impalas). Their size allows them to overlook the landscape for predators and provide an early warning for all. 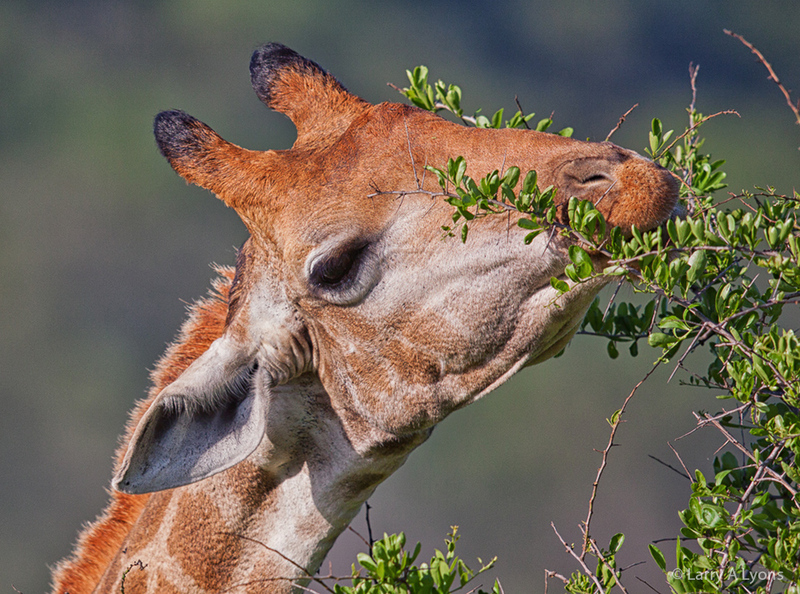 Because of their long necks, giraffes can feed on foliage from trees and shrubs that would not be accessible to other herbivores. The principal food source at the Thanda Reserve is the leaves of the Acacia tree with its long spikes. 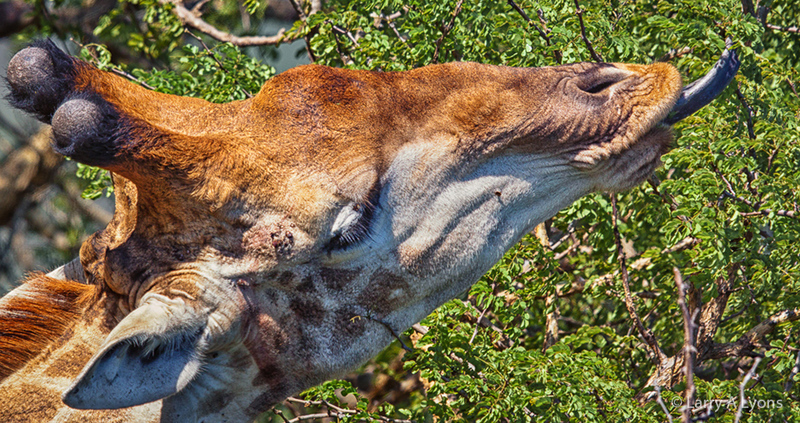 The giraffe has a long prehensile tongue that is able to pull branches even with these long spikes into their mouth and then strip the leaves off the branches with their teeth. 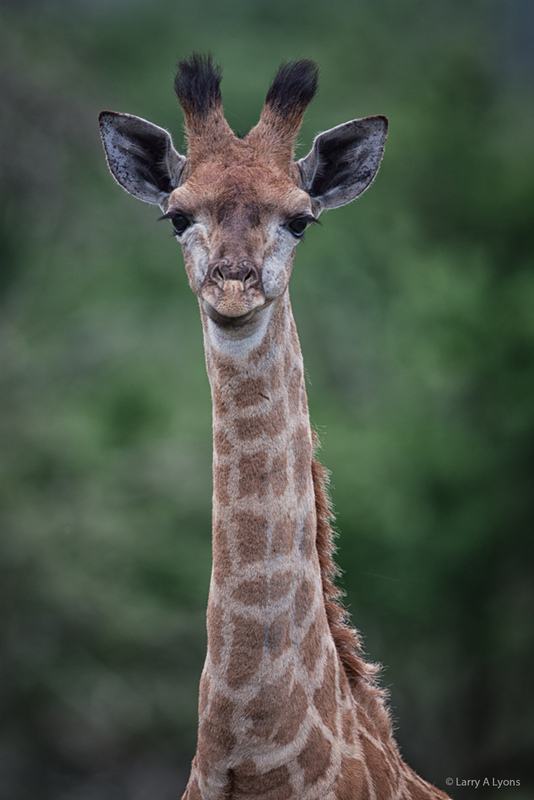 This baby giraffe is less than one month old and already stands six feet tall. Baby giraffes will drink milk from their mother during the first few months. After that time, the babies will begin eating leaves. If the baby cannot reach trees with leaves, mothers will pull leaves off and feed them to the babies. 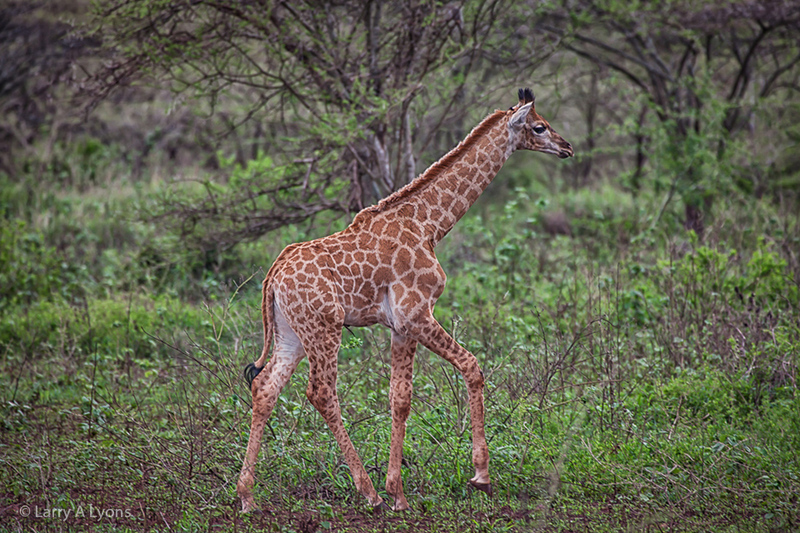 Baby giraffes will gain most of their height and weight during the first three years of life. Giraffes are considered fully mature at four years of age. 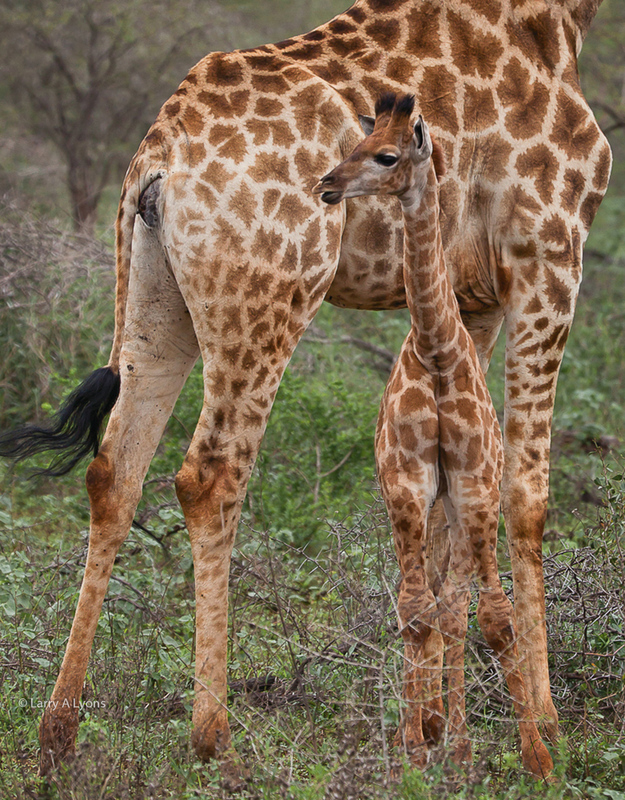 Usually the giraffe calves are more vulnerable to predation by lions, leopards, wild dogs and hyenas. However, this adult giraffe became the feast of a lion pride from the previous evening. 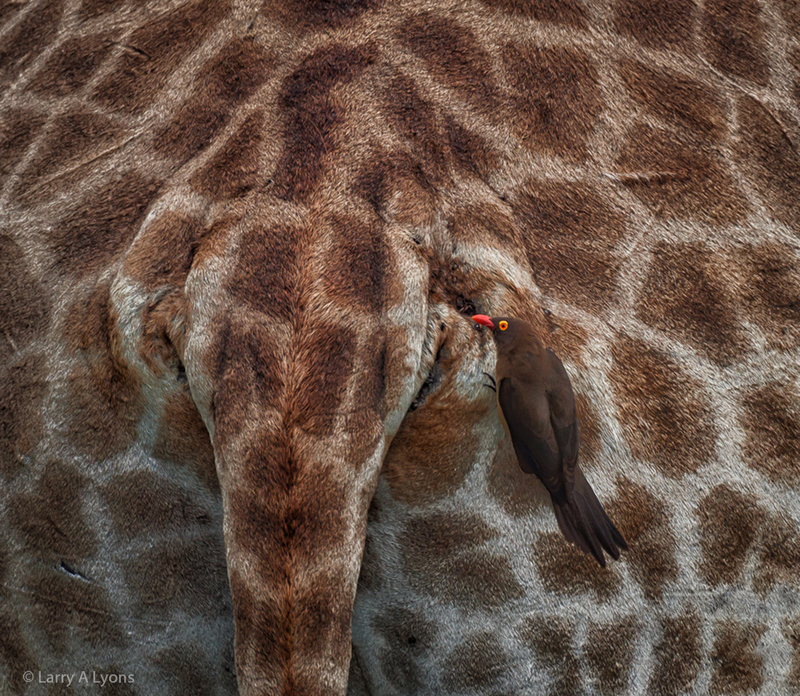 Here is a yellow-bellied oxipecker clearing the ticks off of a giraffe. 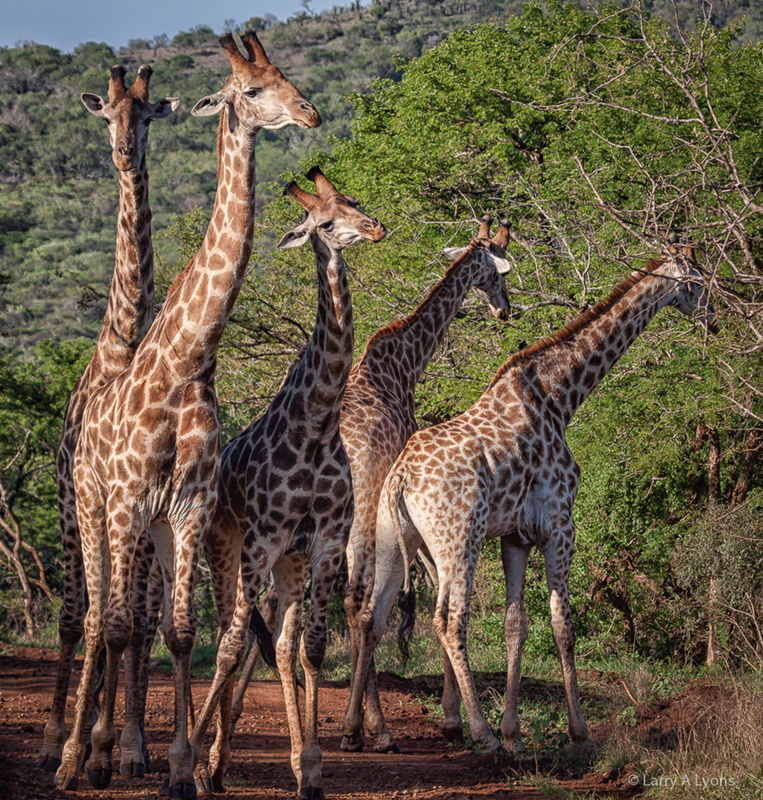 One of the most wonderful encounters is when you can meet-up with male giraffes while they are engaged in necking. 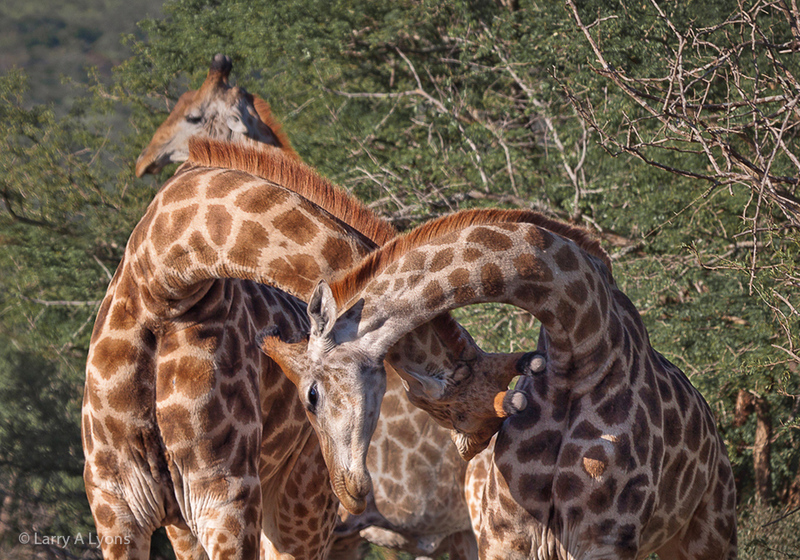 Necking is a ritual in which male giraffes are establishing dominance with their necks swaying and touching each other. You think of “Fantasia” while watching these encounters. There is almost absolute silence when this necking is occurring and then they just seem to gently make-up. The zebra belongs to the horse family. 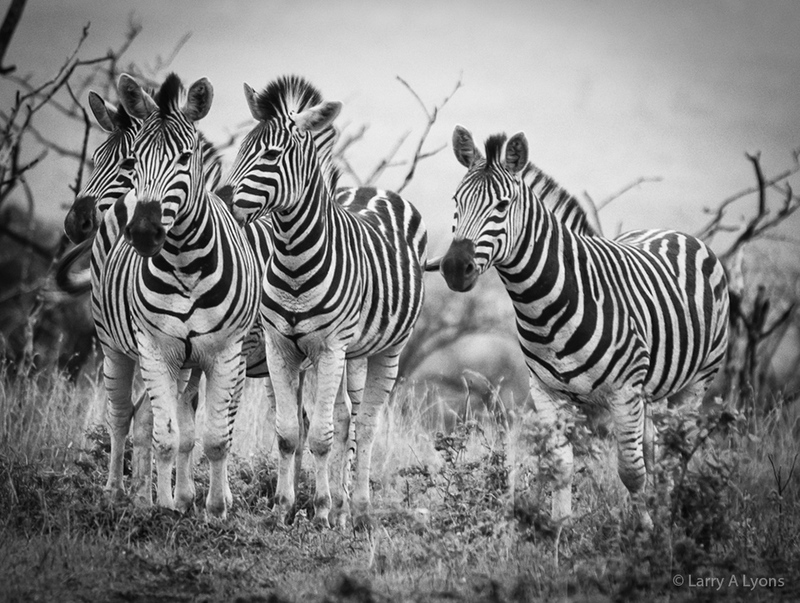 Zebras are sociable animals and are often seen with other herbivores, like giraffes, wildebeests and impalas. 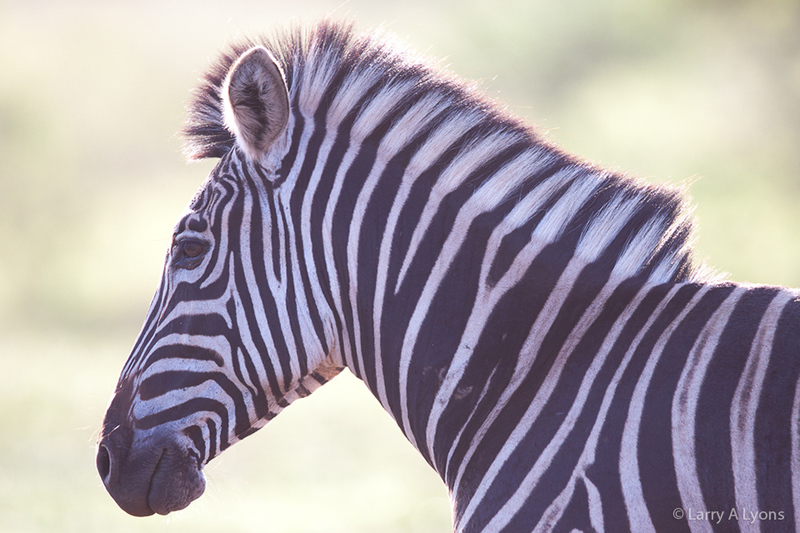 Zebras live in small family units, called harems, led by a stallion. Stallions disputing over dominance of the harem. 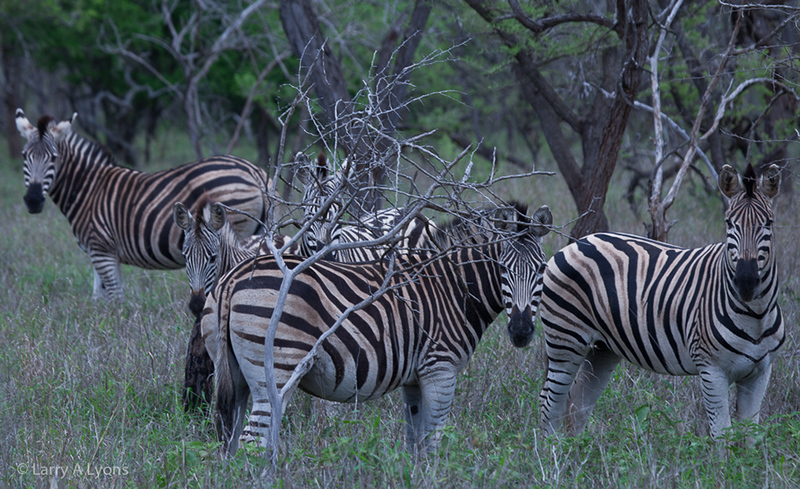 Each zebra has its own striking pattern of stripes. They are like the fingerprints of humans. Members of a family supposedly can recognize each other by their patterns. 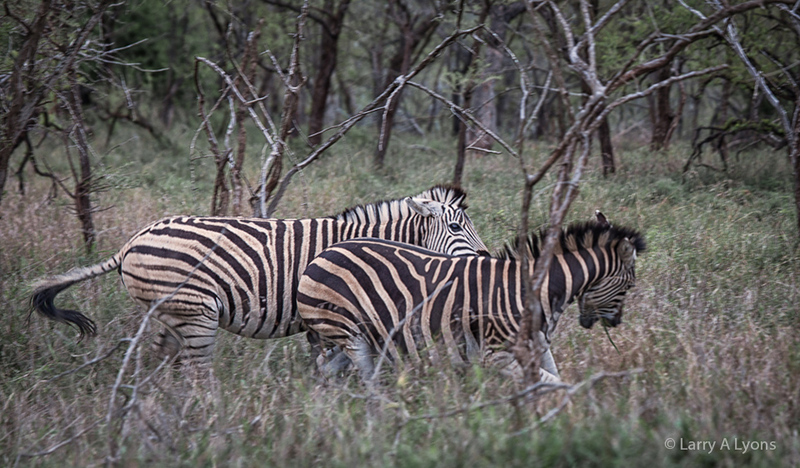 The stripes provide good camouflage, particularly from a distance, from predators. Zebras are prey to lions and hyenas. 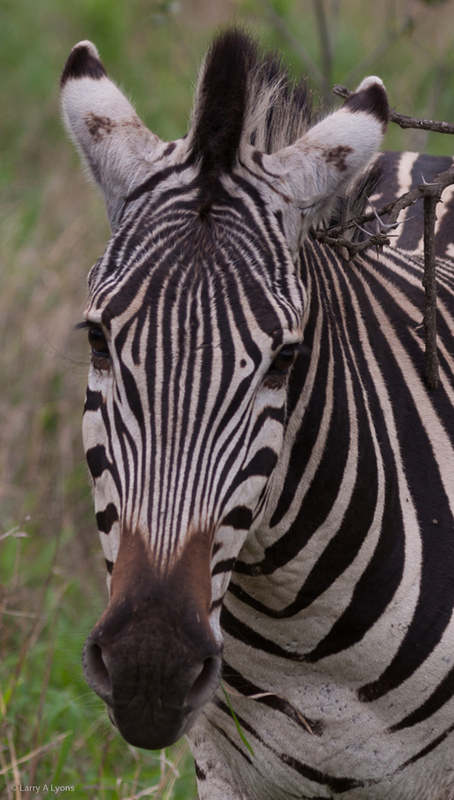 This zebra has a visible scar on its neck. The scar is its’ “badge of courage” from escaping a lion attack. 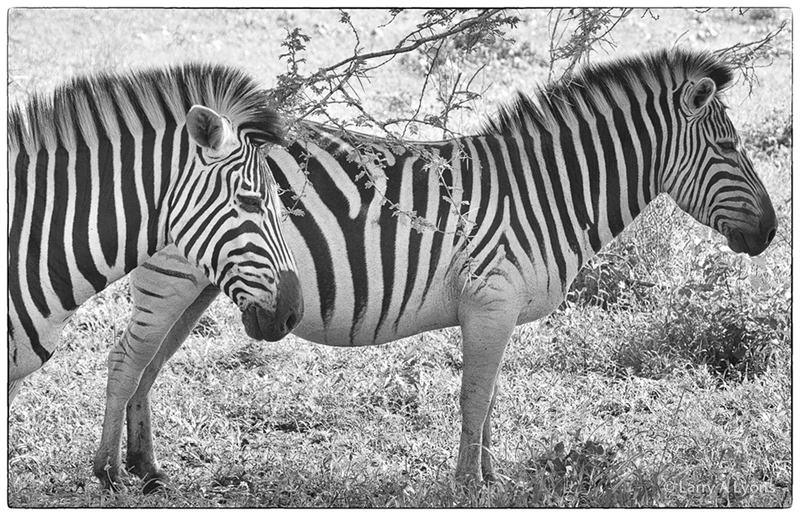 The greatest threat to the zebra is habitat loss from farming and ranching, as well as, competition for water with livestock. 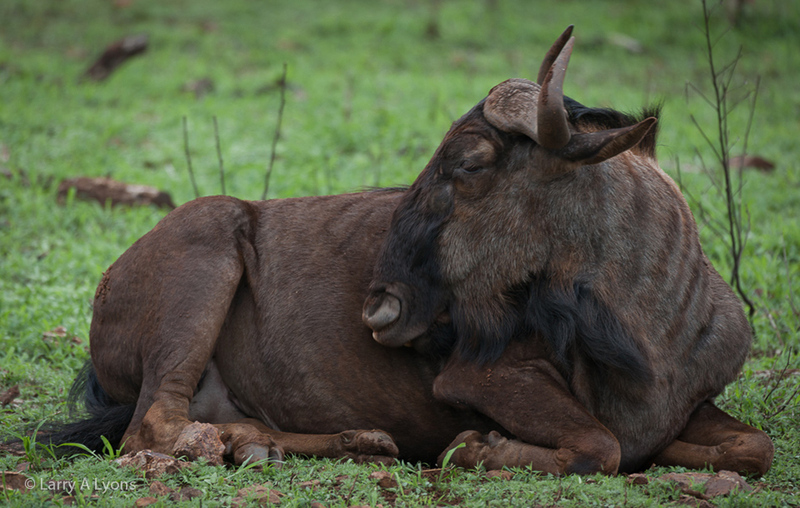 Game reserves, like Thanda, provide an important refuge for their livelihood. Beauty only a mother can appreciate. 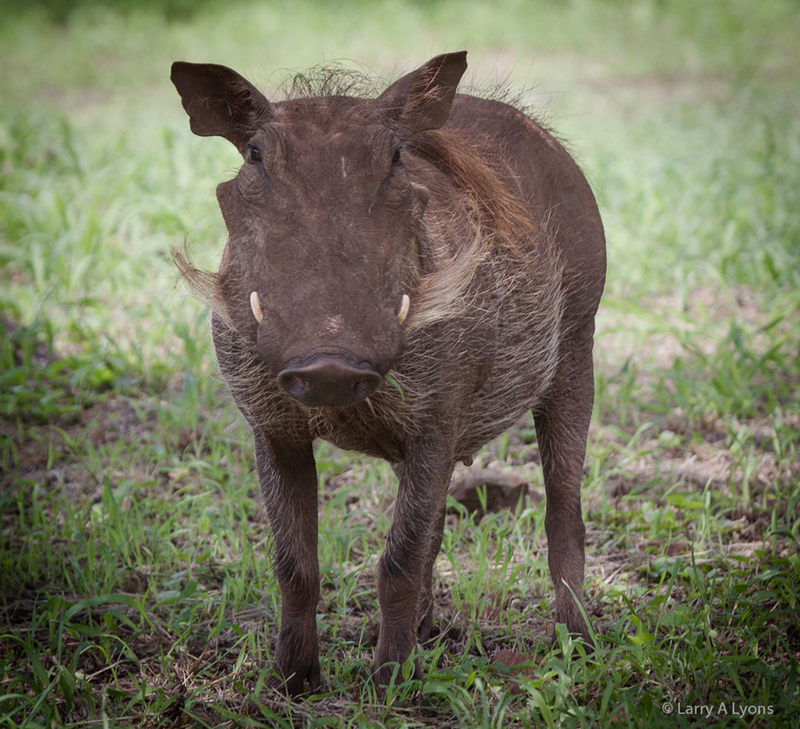 The warthog is a wild member of the pig family. 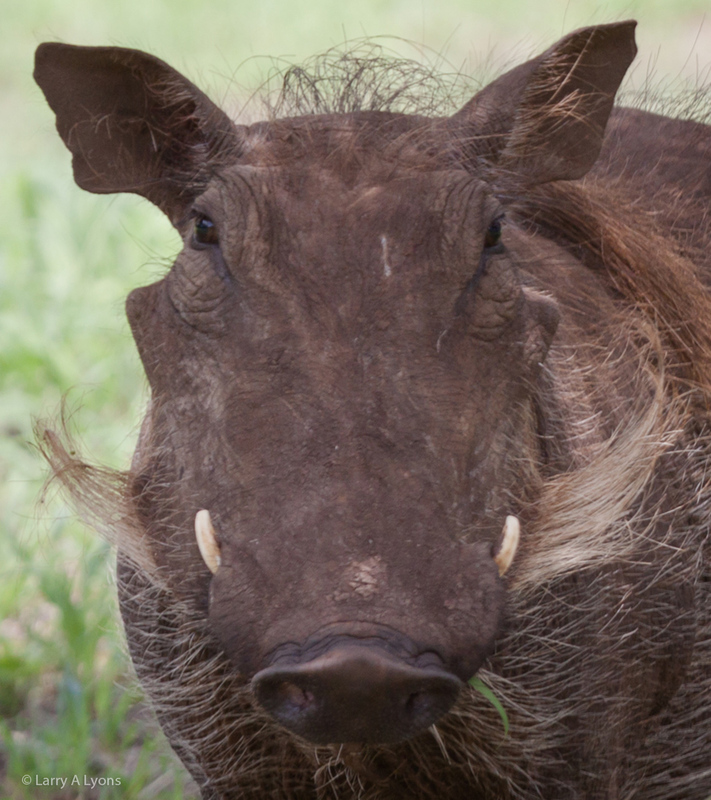 Male Warthogs have two large pairs of warts that are situated below the eyes and between the eyes and the tusks. 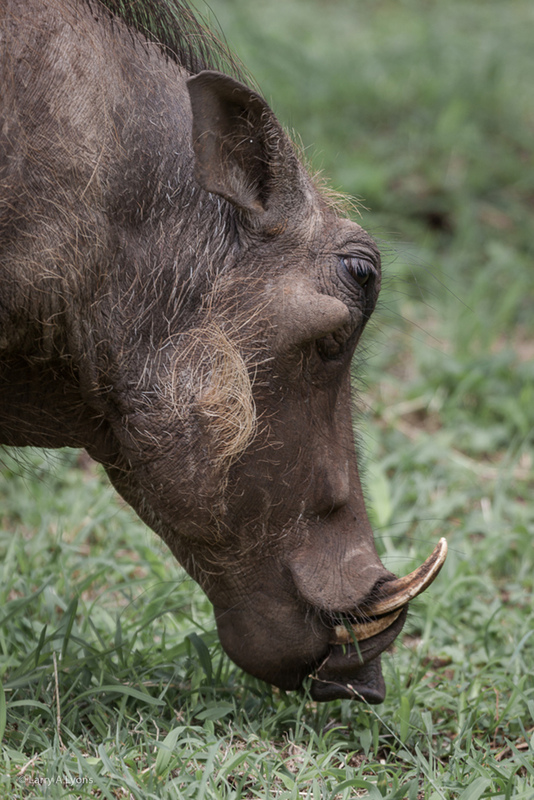 The female warthog has one pair of warts below the eyes. Two pairs of peculiar looking tusks protrude from its mouth. The tusks are used for digging, combat between each other, and defense. 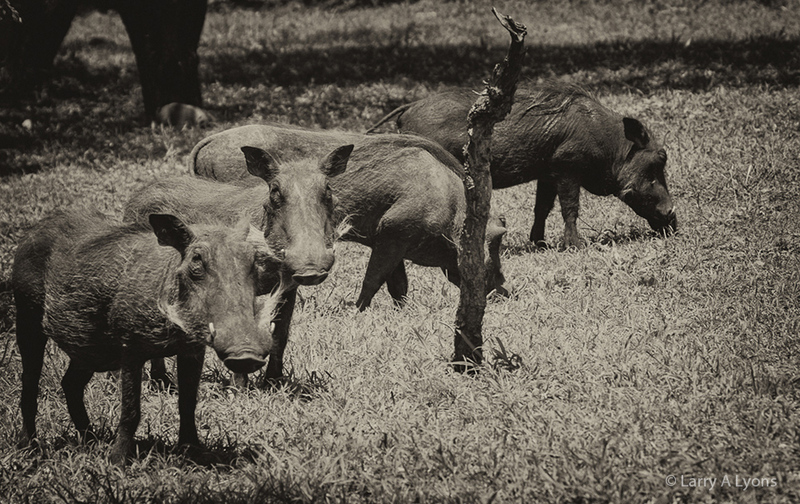 At the Thanda Reserve, warthogs can never be missed since they are commonly seen browsing within the camp. 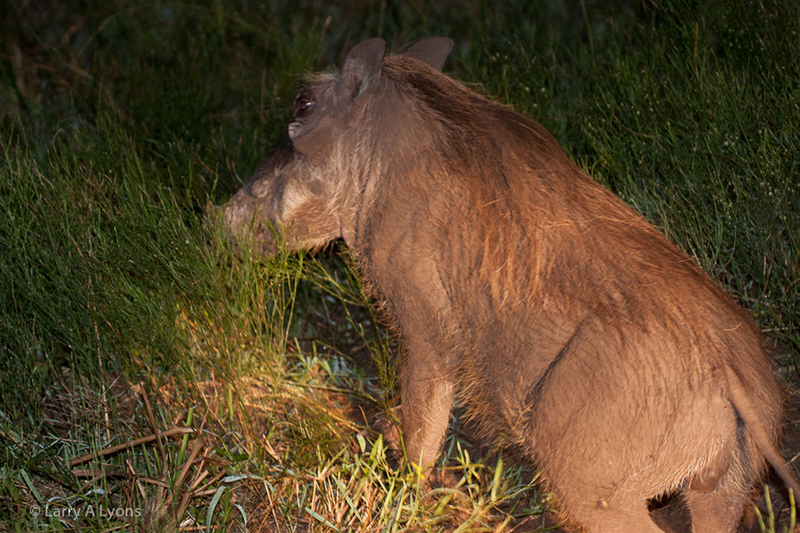 This warthog was observed exiting a tunnel during a night safari drive. Predators of the warthog are humans, lions, leopards, crocodiles and hyenas. 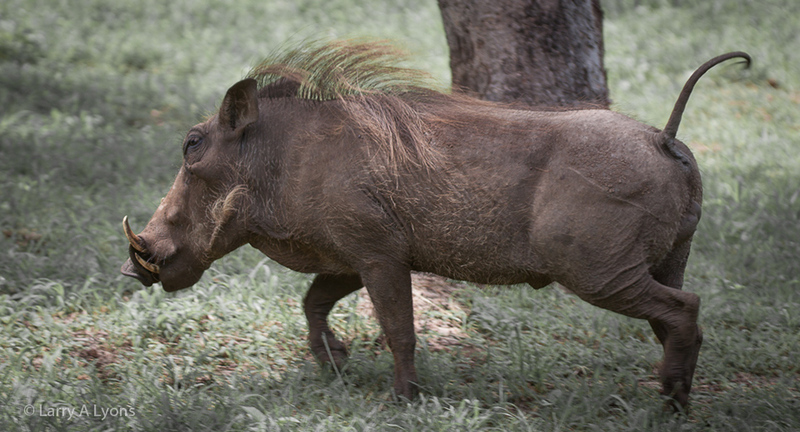 The warthog’s primary defense is to quickly sprint from the scene. 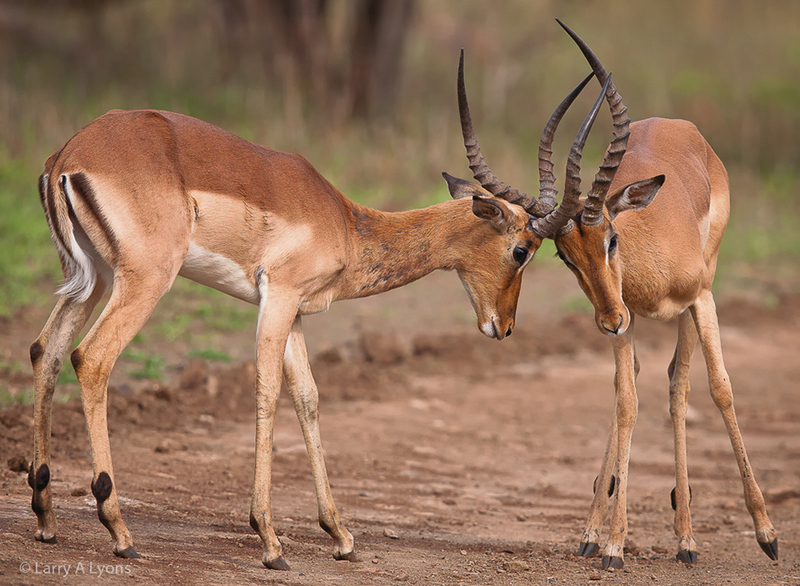 Impalas are one of the most common antelopes in South Africa. 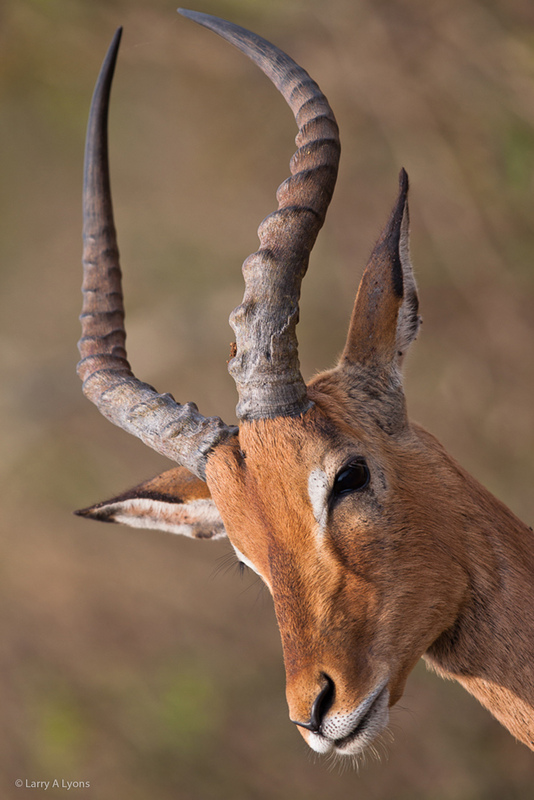 Male impalas are quite distinct with their graceful lyre-shaped horns. 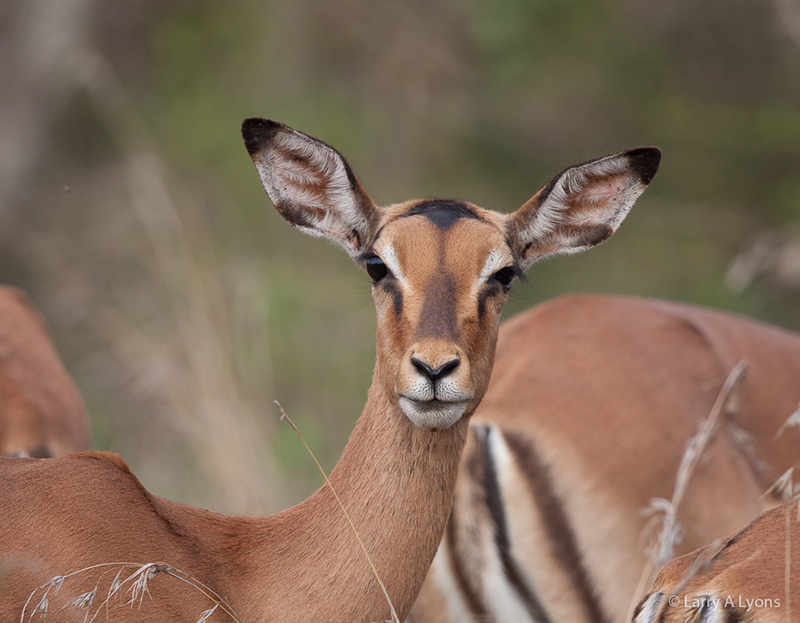 Female impalas look like the males without the horns. 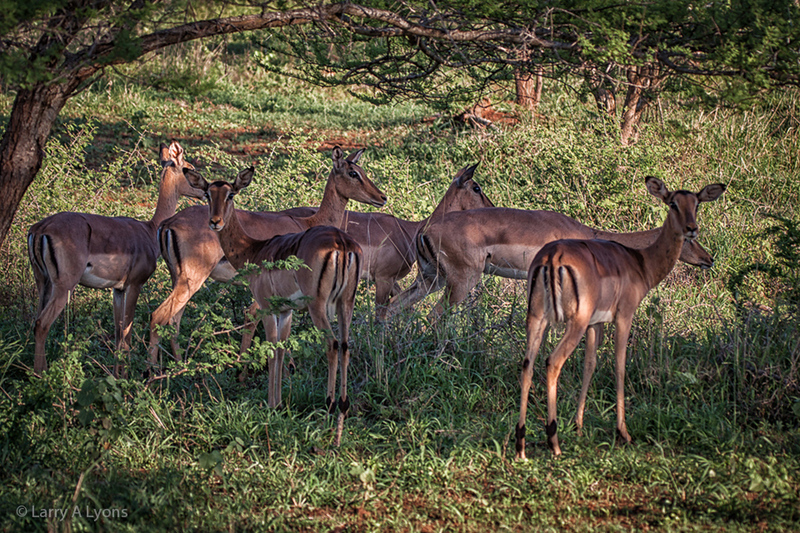 Impalas graze on grasses and shrubbery. 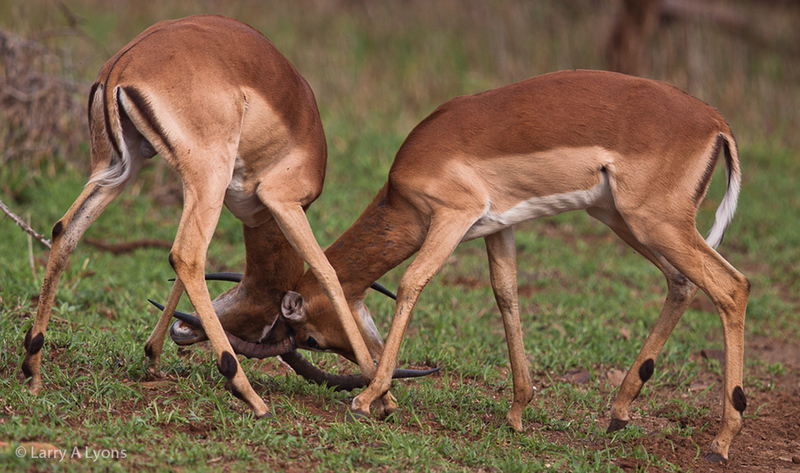 Male impalas become quite territorial shepherding females about their land. 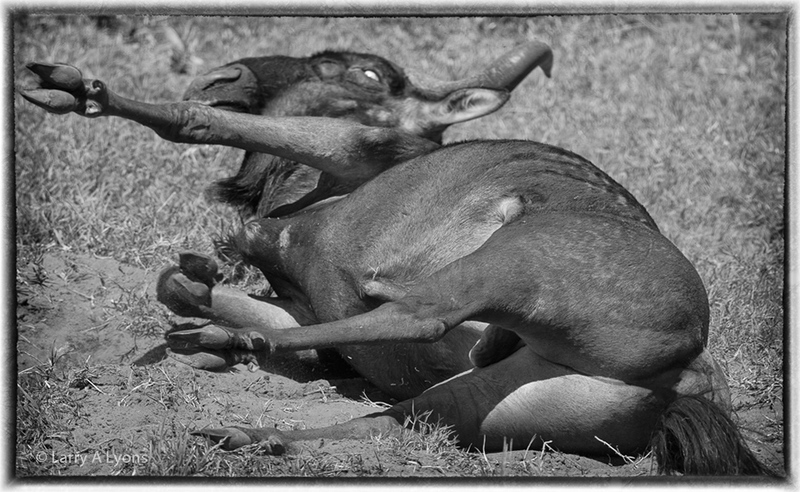 These dueling males are displaying a common ritual over maintaining dominance of the herd of females. 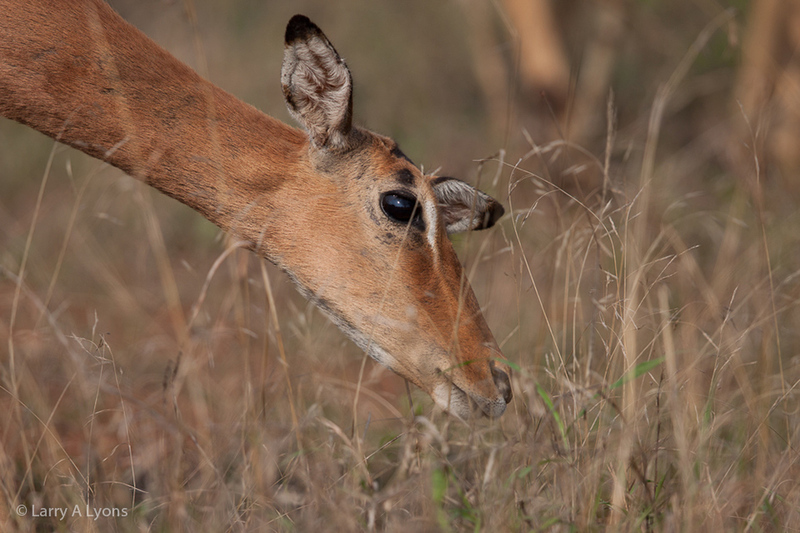 Most large carnivores will prey upon impalas. They are always on the alert and will snort an alarm when there is danger. The whole herd will scatter. 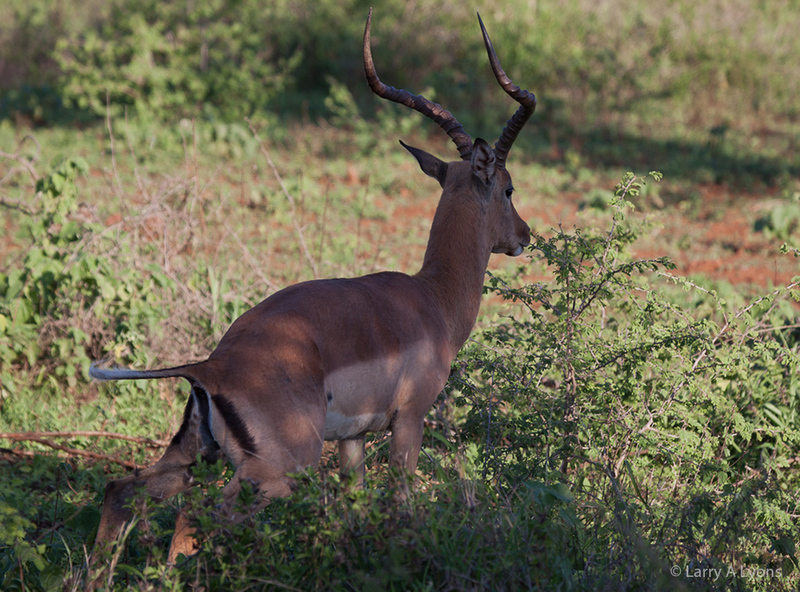 Impalas have a distinct scent gland that is covered with tufts of black hair on the back of their hind legs. The scent gland releases signals that aids in keeping the herd together particularly when they are rapidly running away from a predator. So were you able to imagine these “Everyday Faces” roaming in your backyard. There is nothing like a wildlife experience in Africa. 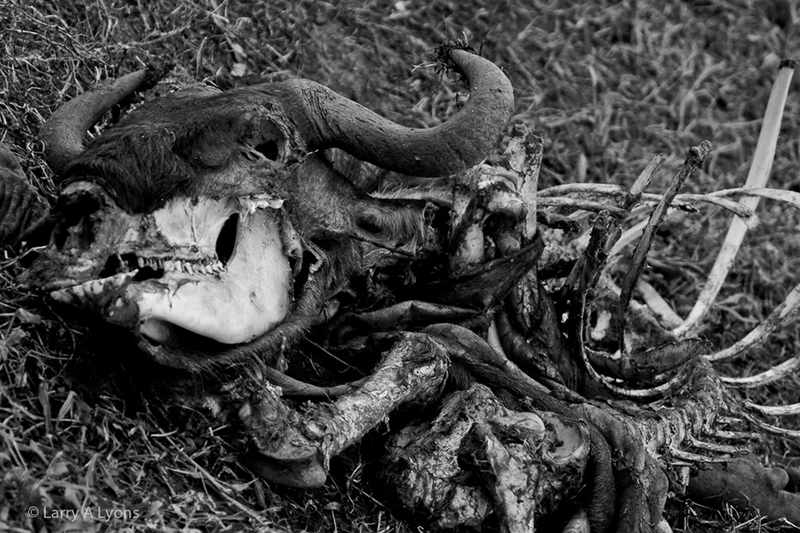 There will be forthcoming posts on South Africa and the Thanda Game Reserve. So stay tuned. Larry … you’ve been holding back on me…. I had to find out about this on our Yahoo site!!!! Well to your defense, I have been gone (mentally) for about 3months. Daughters wedding, family and a realignment at work.